I was born to be a psychotherapist. No, that’s not being egotistical or arrogant; at a “certain age,” you come to know your strengths as well as your limitations. You have to – there’s probably not much time left to live each day with intention. Like I said – I was born to be a psychotherapst. But little did I know that I would gain even more credentials while working in Community Mental Health. Thanks to my colleague Katherine and my patient Ben, I was awarded the M.T.E., or Mouse Therapy Expert, specializing in a Rodent Recovery Program. Drop-ins welcome. Group rates available. Perhaps I’d best explain. Working in Community Mental Health is not for the faint of heart. Resources are almost non-existent, schedules are jammed and the clients/patients are desperately in need of good mental health services. For some reason, my supervisor determined that as a counselor, I worked well with “chronic” patients: those who were in and out of the system, with long mental illness histories and a poor prognosis. It was common for the patients and therapists to give up, with little progress made through no one’s fault. Ben was fairly typical of his diagnosis and personality: middle-aged, never married, still living with his mother, poor social skills, no friendships, unemployable, but a genuinely nice man. Somewhat rotund, Ben would shuffle into my office, his round face anxious but with a bit of a smile, his regular outfit of jeans and a plaid shirt freshly washed and ironed (by his mother). He always sat at the edge of his seat for the entire session, as if he would bolt out of the door at any moment. As usual, he would start his first sentence with, “Theresa…” and launch in to his latest anxieties about his family, his finances, his nightmares and his smoking habit. In Ben’s case, therapy was often nothing more than reassurance for his many worries, making certain that he was taking his medications correctly, and setting his mind at ease that he would never be homeless in his present situation; that there was enough funding available, as well as local resources, to help him survive. It was just another day as I jotted a few things in his record, Ben and I discussing his goals for next week. I heard a bit of a thump, but extraneous noise was common in the building – shredders, telephones, voices, drawers slamming, people walking down the hall, etc. – so I didn’t think anything of it. As I listened to Ben, my eyes drifted to the window behind him, and there on the ledge was the cutest, tiniest mouse that I had ever seen. He sat there on his hind legs, calmly looking at me. Then, (was that a smirk on that adorable face?) he leaped to a near-by electric cord and started to make his way down towards the floor. Which would put him by the back leg of Ben’s chair. Which was far too close to Ben’s feet. All this time, I’ve got a poker face, but my mind is racing a mile a minute. Ben – a bit of a paranoid schizophrenic, with auditory hallucinations and fears of just about anything – far too close to a mouse. A brief aside – I am not really afraid of mice, but I prefer rats. Ever since I worked with rats as a biology major in undergrad, I found them to be friendlier and not as quick to nip at your fingers. (Lab rats, at least. I can’t account for sewer rats the size of dogs.) I genuinely was concerned about not setting Ben off emotionally with a cute little mouse crawling up his leg. Disney at a time like this. “Yes.” I feel Ben restless behind me. 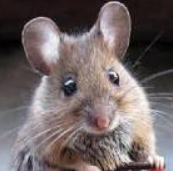 Katherine – my heroine – takes one look at Matt (that’s what I named the mouse) – and puts both hands up while she backs out of my office. “I don’t do mice.” So much for colleagues coming to the rescue. At that point, Matt scurries back up onto the window sill. I hear someone behind me, and there’s a very confident-looking man (not my supervisor) walking up to the mouse. Katherine explains from the doorway, “My client is a hunter; he said he’ll take care of it.” Without any hesitation, the man grabs the mouse. With Matt cupped in his hand, Katherine’s client walks down the hall to release him into the wild (the bushes outside our building, which probably means the mouse will be back inside in 30 seconds flat). I see Ben cowering against the wall, inching his way toward the waiting room. “I’m going to leave now, Theresa. Is that okay?” I assured him it was, so he tore out of the building and raced down the steps. (I was hoping the mouse wouldn’t leap out of the bushes; we’d have to carry Ben through the parking lot to the hospital.). We calmly asked all of those waiting to disperse from the hallway and told them everything was okay. All in a day’s work. I made a mental note to call Ben the next day in order to check on him, since I knew he had trouble sleeping. I hoped this mouse incident wouldn’t cause a nightmare. The next morning, promptly at 8:30 am, Ben called me before I could call him. “That’s no problem, Ben. It seems a lot of people don’t like mice.” Once I knew he was fine, we made another appointment for next week. I explained that I didn’t know, but I was sure maintenance and housekeeping would be on the look out from now on. I kept the shock from my voice and answered with Ben’s same sincerity. “You’re right, Ben – it’s a good thing there were no ladies there.” We said good-bye and I hung up, shaking my head in amazement. At least I was doing something right – Ben obviously viewed me as his therapist, and not as a female. But my Mom, who would accept nothing less from her daughters than for them to be “ladies” – would be appalled and disappointed about my new status. After all, there were no ladies present. This entry was posted in Humor & Pathos, Special People I'd Like You to Meet, Thursday Re-View. Bookmark the permalink. And thank you for reading it!!! The things you can understand about people in 10 minutes flat…that would otherwise take years. Thanks, Mark. What a brilliant idea you’ve offered…I do believe that’s a form of pet therapy!!! Great story! I hope Matt is happy in the wild and not ready to swing from cords in your office. Thank you for reading and commenting. Welcome! Eliza – you answered your own question. Speed, ability to navigate into tiny places (including our pockets, etc. ), the element of surprise – this, and other things, all add up to a creepy, crawly, unwelcome addition to our world. We stay out of a big animal’s way to survive; little guys come into our world uninvited, and often stealthily. They wrest control from us, and we don’t like it. Great story, Theresa! Reading it was like being there. Thank you!